EYSA has a single Premier club: Eastside Football Club (EFC). 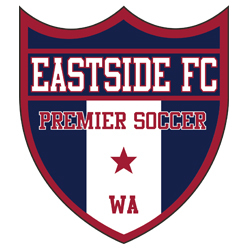 Eastside FC represents the highest level of youth soccer in Washington for players beginning at ages 7 and going through U18. The club offers year-round play, and more intensive skills development and higher levels of competition, including in the state's Regional Club League (RCL). Premier soccer, sometimes called "elite" soccer, requires a greater commitment from players, parents and coaches, places a greater emphasis on winning, and, at the older ages, is considered the best path to playing collegiate-level soccer. Premier soccer has paid coaches, who are typically long-time players of the game and have USSF national "D" soccer coaching licenses or above. Premier teams practice and play all year long with a few breaks, usually during the end-of-year holidays and sometimes, depending on the team, for a short period during the summer. Teams can expect to play in premier-level tournaments throughout the year, especially in spring and summer, with increasing travel for the older ages.